Idaho's wild salmon and steelhead are in trouble. Scientists say that at least 2 percent of the young fish migrating to the sea (smolts) must survive and return as adults for Idaho's salmon and steelhead stocks to sustain themselves. That has happened only twice in the last 17 years. To actually rebuild the populations, scientists say that 4-6 percent must return. In other words, the status quo ensures decline for these fish that define Idaho and the Northwest. Eight massive dams in the Columbia and Snake rivers that stand between Idaho's spawning grounds and the Pacific are the biggest factors in the decline of Snake River salmon and steelhead. The slow-moving reservoirs behind the dams are thermal traps that kill fish. 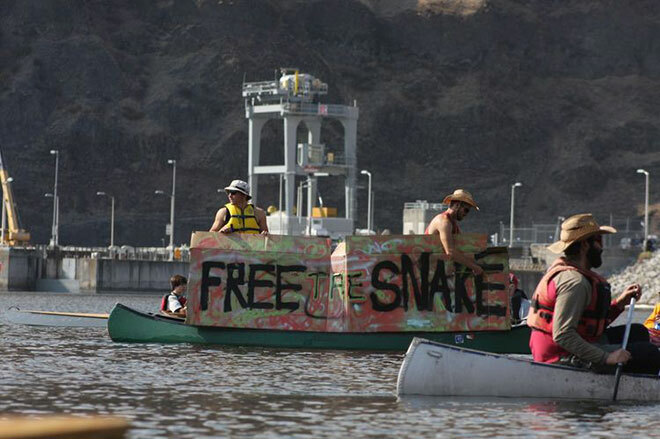 In the hot, dry summer of 2015, salmon died when they encountered lethally warm water in the reservoirs behind the four lower Snake River dams. Unlike a free-flowing river where water temperatures cool down at night, reservoirs trap heat and stay hot. Without new ideas and a better approach, Idaho's wild salmon and steelhead will go the way of the passenger pigeon. Overwhelming scientific evidence supports removal of the four lower Snake River dams as the best way to recover Snake River salmon and steelhead. If there are other actions that can fix the deadly lower Snake River migration corridor, we are all ears. Finding a solution to the continued decline of Idaho's salmon and steelhead will require looking at the needs of fish and local communities, together. Two decades of litigation have failed to force the government to take more decisive action to recover Idaho's oceangoing fish. More than $12 billion has been spent on actions that fail to address the single-most important limiting factor for the fish. Simply put, not enough fish survive passage of the dams. In 2008, under the leadership of then-Gov. Jim Risch, Idaho brought together sportsmen, counties, environmentalists, industry and others to protect Idaho's 9 million acres of roadless areas. It wasn't easy. It required compromise and negotiation. It took time. And it worked. The government needs to follow Idaho's lead and bring together farmers, tribes, states, conservation and energy interests, and local communities to save Idaho's salmon and steelhead. It isn't just about the fish. Northwest electricity ratepayers and federal taxpayers provided millions of dollars for habitat restoration. Habitat in rivers such as the Yankee Fork, Lemhi and Pahsimeroi is much improved. Idaho possesses some of the finest salmon habitat on the planet, but if the fish can't move from the ocean to the mountains and back, that habitat will remain a five-star hotel without guests. We know how to recover Idaho's wild salmon and steelhead. And we know how to protect the economic well-being and quality of life of affected local communities. It's time for the government to step up and do its part. Remove those harmful dams!!! keep writing these articles to spread the news!! "Overwhelming scientific evidence supports removal of the four lower Snake River dams as the best way to recover Snake River salmon and steelhead." With climate change projections making the water quality in these reservoirs even more lethal to salmon (and harmful to people), dam removal is the only way to recover wild, self-sustaining populations of salmon and steelhead. Great to see TU leadership speaking loudly on this issue. Chris Wood is the president and CEO of Trout Unlimited, the nation's oldest and largest coldwater fisheries conservation organization.